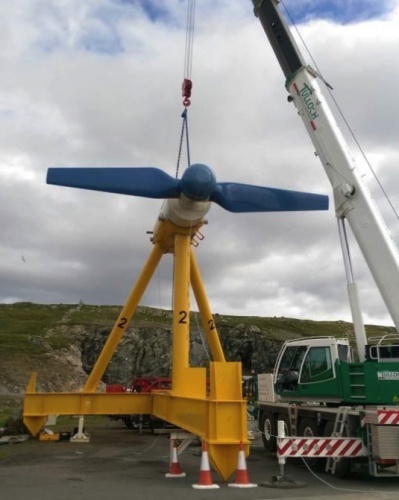 A new tidal energy scheme off the coast of Shetland has exported power to the grid for the first time its developers have announced. Currently under construction, and expected to be fully complete by 2017 the Shetland Tidal Array will ultimately see five 100kw horizontal access turbines installed on the seabed in the n the Bluemull Sound, the strait between Unst and Yell in Shetland’s North Isles. The project is a collaboration between Belgian green energy specialist ELSA and Scottish Tidal energy firm Nova Innovation which has developed the so-called Nova M100 turbines which form the array. This highly modular subsea system is claimed to be easier to transport and install than competitive technologies. The scheme has also been welcomed by WWF Scotland, whose director Lang Banks hailed it as an important step on Scotland’s plan to become the EU’s first fully renewable electricity nation by 2030. As well as investment from Nova and ELSA, the project has also received £1.9m funding from the Scottish Government. German lifting specialist Hansa Heavy Lift transported a BioPower Systems, or BPS, pilot unit and retrieval rig from Vũng Tàu in Vietnam, to Portland, Australia. The cargo weighed 698 tonnes and was lifted onboard Hansa’s HHL Freemantle using the ship’s inbuilt cranes. These provide a combined lifting capacity of 1,400 tonnes. The BPS units measure 26 meters long and will be used to convert wave power into electricity as part of a planned wave energy plant. Upon arrival at Portland the units were discharged directly into the water using the vessel cranes. The HHL Freemantle then traveled Port Fairy to carry out further installation work for the plant. “The positioning of the ship was crucial to ensure accurate heading alignment. The unit had to be lowered through the splash zone at an angle of 15 degrees in order to reduce dynamic effects from the waves before lowering it to the seabed,” said Ian Broad, Hansa director of cargo management. The firm said it ensured a rigorous process of pollution control was carried out on all equipment, including shackles, grommets, crane hooks/blocks, and heave-compensators to prevent environmental damage. US wave developer Columbia Power Technologies has received a patent from New Zealand for its StingRAY device’s generator air-gap control system. The Oregon-based company says the system allows a smaller air-gap between a large-diameter generator’s rotor and stator, improving performance and availability without a corresponding increase in weight and cost. The design is being validated in a US Department of Energy-sponsored land-based test. The pre-assembly of a 6.6-meter diameter generator is currently underway in Ridgefield in Washington state. Once the pre-fit work is finished and approval to proceed has been received, the system will be tested at the National Wind Technology Centre near Denver, Colorado. Columbia Power’s StingRAY wave power technology, which has received eleven patents, employs two large-diameter, direct-drive permanent magnet generators and will be tested at the US Navy’s Wave Energy Test Site following the power take-off testing.